Den 9 april 2015 gästföreläste docent Leena Kuure, Oulun Yliopisto, Finland på Högre seminariet vid Institutionen för språkdidaktik, Stockholms universitet. 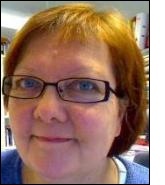 Leena Kuure is interested in the multimodal practices of (language/literacy) learning in our everyday, technology-rich world. Recently her research has focused on language learning in informal, networked settings, on children's and young people's genuine participation as well as on language students' and teachers' challenges in anticipating future prospects of technology-development, and the affordances they will provide for language education. In the past she has also studied learner language, bilingualism and aspects of text accessibility. Her methodological framework draws on mediated discourse and nexus analysis and she uses multiple types of data. Her research is often conducted in multidisciplinary collaboration (Languages, Sociology, Information Processing Science). The presentation provided an introduction to a few research projects focusing on how technology development may be transforming our everyday practices, also in relation to language and teaching as well as language teacher education. The projects apply the research strategy of nexus analysis, which draws on multiple methods and participatory perspective.